101 WAYS TO LEAVE A GAME SHOW: Casting Now! If you have ever thought about trying your luck on a game show, now is the perfect time to audition to be a contestant on “101 Ways to Leave a Game Show”. 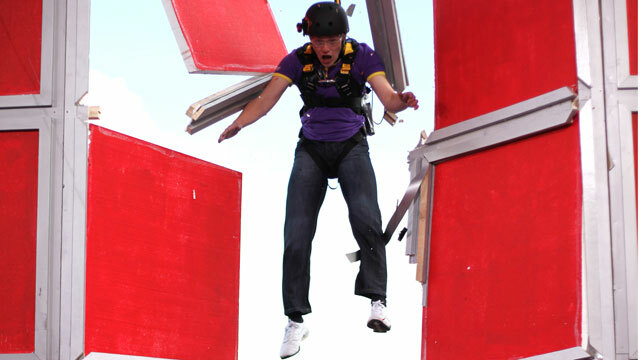 From Endemol powerhouse, the same creators who produce WIPEOUT, and past hits DEAL OR NO DEAL, and FEAR FACTOR is now casting an American version and British version of the show that ejects losing contestants into the air to exit them from the game with wrong answers. You’ll have an opprotunity to win big money. But, if you fail at least you’ll go out with a bang! What better way to be on a game show? Memorable, and effective! An added bonus, each contestant will get a free trip to Argentina where the show will tape. Casting notices have been posted on “craigslist.org” for the game show. It states that the winner will receive $50,000. Contestants must have pop culture and general trivia knowledge, have a current passport, be a legal U.S. resident, be 18 years of age or older, reside in California and be available from August 8-15. The show is also looking for people that are “big characters..that must be strong, loud and fun!!”. As well as have “strong opinions and aren’t afraid to share!”. Tips On A Successful AMERICA’S GOT TALENT Audition – Season 9! Game Show Reality! TRUST ME, I’M A GAME SHOW HOST Casting! Contestants Wanted to Beat the Chaser! THE CHASE Casting! Be a Winning Loser! THE BIGGEST LOSER 11- City Casting Search! how do i become a contestant on the uk version? how do i becom a contestant on the uk version of the show ?